Rouge Bouillon from Midvale Road to the Robin Hood will be closed from Saturday (6th April) for two weeks for the second phase of our mains renewal. This first phase of work between Queen’s Road & Midvale Road was completed in February. Phase two will continue from Midvale Road to the Robin Hood and is a full road closure. We are undertaking the work during school holidays to minimise disruption, this work is part of a combined utility works, to prepare the road ready for resurfacing. We apologise for any inconvenience caused whilst undertaking this essential work. The Emergency Road Works were completed on Tuesday 6th September and the road re-opened at 4pm. We would like to thank everyone for their patience whilst we undertook these essential repairs. Following a mains water burst at the junction of St. Clements Road, Grève d’Azette and Havre des Pas traffic control measures have been implemented this morning for the next 48 hours. This will cause significant delays at peak periods. St. Clements Road is closed to south bound traffic from Route du Fort. The south bound 1A bus has been diverted and will pick up from outside the Ommaroo Hotel bus stop. The bus stop in St. Clements Road opposite the garage has been temporarily suspended until the road is re-opened. Customers that normally use this stop can catch the 1A from the stop outside of the Ommaroo Hotel. St. Clements coast road, Greve d’Azette and Havre de Pas will remain open but traffic control will be in place at the roundabout outside of the Hotel de Normandie. North bound traffic will be able to use St. Clements road. 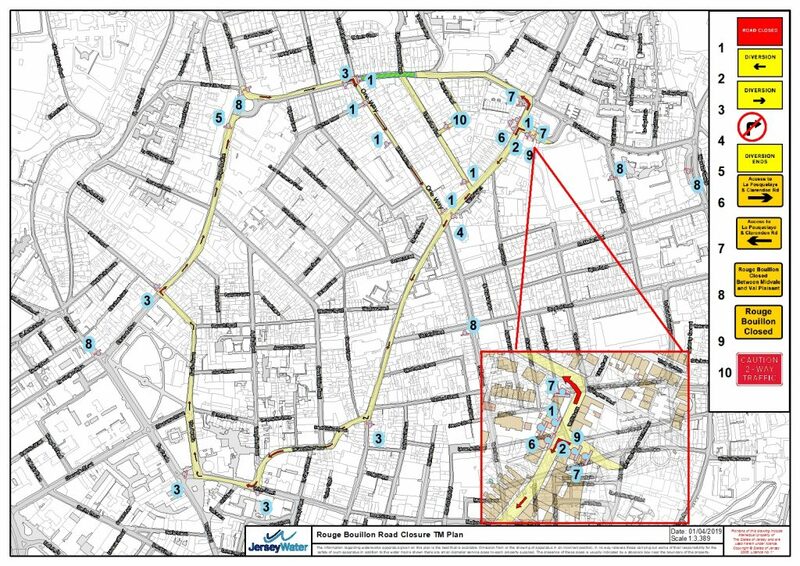 Customer’s water supplies will not be affected during these repairs and it is hoped that the road will be open within 48 hours; if possible please avoid the area. Jersey Water would like to apologise for the inconvenience that this will undoubtedly cause and wishes to reassure the public that it is using all its resources to make these emergency repairs as quickly as possible.